After doing our article on the Army Para badge by C E Juncker of Berlin, a few people asked some questions and I feel now is an appropriate time to give a response. 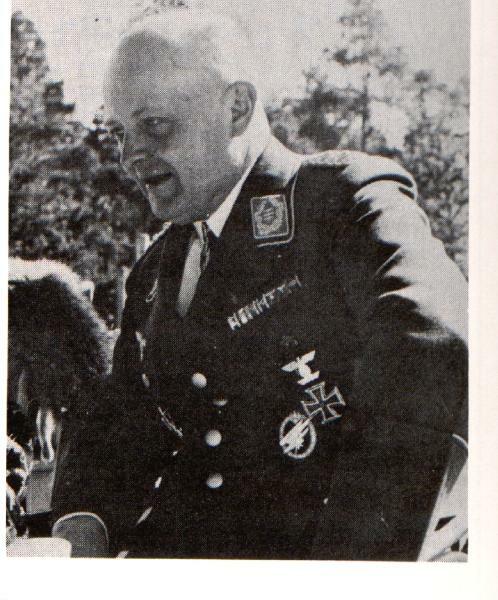 As we have established, the aluminium Paratroopers badge has set die characteristics, it is unique like a finger print. The expression "Straight as a Die" says a lot. The questions raised not only concerns the Army Para badge but the firm of Juncker and so we have tried to address these as a whole. The first point raised is 1) Why have some badges got a "?" hook and others the "C" hook and some the "G" type hook. The answer is quite straightforward. The badge manufacturers brought in from another retailer the component parts of pins and hook assemblies, and used what was available at the time. Hence you can have magnetic pins, non magnetic pins, fluted, Broad bladed, neadle pointed etc, and the hook as well as hinges can come on a round plate, circular plate etc or no plate at all. The choice is amazing. 2) Why has this Juncker badge got a different makers mark than my Juncker badge. Again the answer is a simple one. 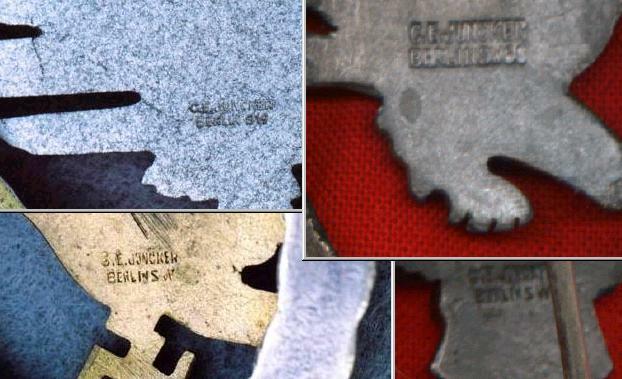 Many people make the mistake of thinking that Juncker only had one die name stamp, and that any variation are copies. One person even has gone as far as stating that all pre war Juncker marked badges have an angular "S" like a backward "Z" for the last part of the trade mark (the "SW") and that half way through the war this changed to a rounded "S". If only it was that simple but consider this. Imagine you are a big firm, with lets say, 20 employees. Would you scrap your name punches and get another load made up.! No is surely the resounding answer! C E Juncker used many trade marks on many different badges, it is more logical to assume that just like in England, any fabricator, (be it porcelein, etc.) would have his or her own trade name die punch and would mark the badge/medal etc with this when it was completed. This is done for a couple of reasons First and formost, you then get a little advert on each badge saying "I come from Juncker" and secondly if the badge was not up to scratch you could tell who made it and act accordingly. 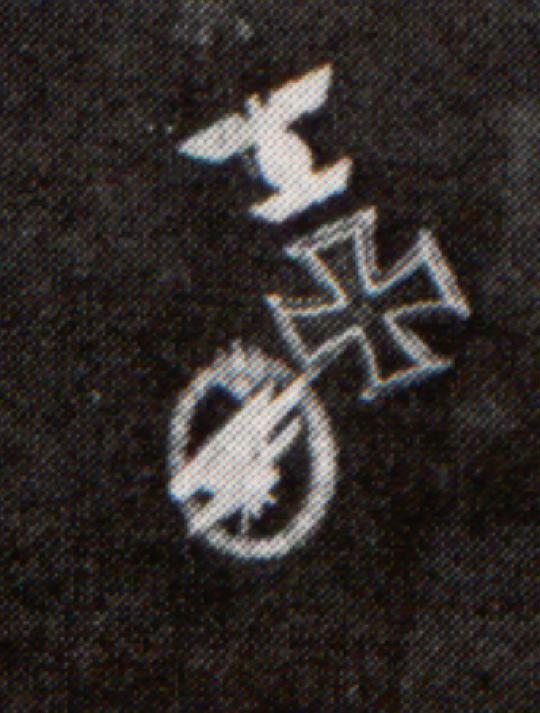 Also just like any firm you will get in orders and for arguments sake say Fritz makes up a bunch of Army Para badges on Monday and marks them with his rounded "S" stamp, on Tuesday he may be making Pilots badges and so on. Next week Wilhelm makes up another batch of Para badges and marks them with his Juncker stamp that has an "S" in the angular form and on it goes. 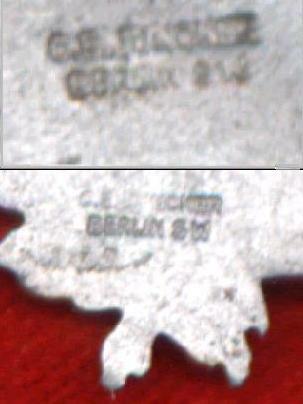 Other marks encountered on other badges also will be the CEJ, C.E Juncker Berlin SW, and C.E Juncker Berlin SW 68. 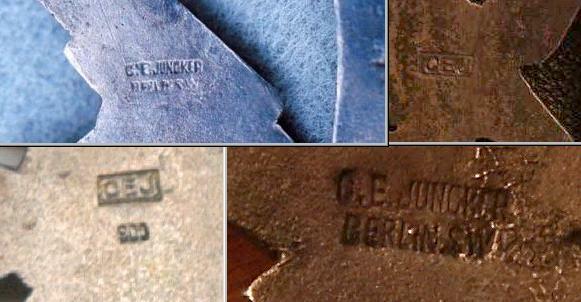 Differant Juncker Name stamps taken from a range of Ealy and late war badges. Scan of an Early CE Juncker badge with the Rounded "S"
3) Finally one other person has stated that the badges should all be positioned identically onto the wreath in the same place with the same angle and that photos show this to be true. 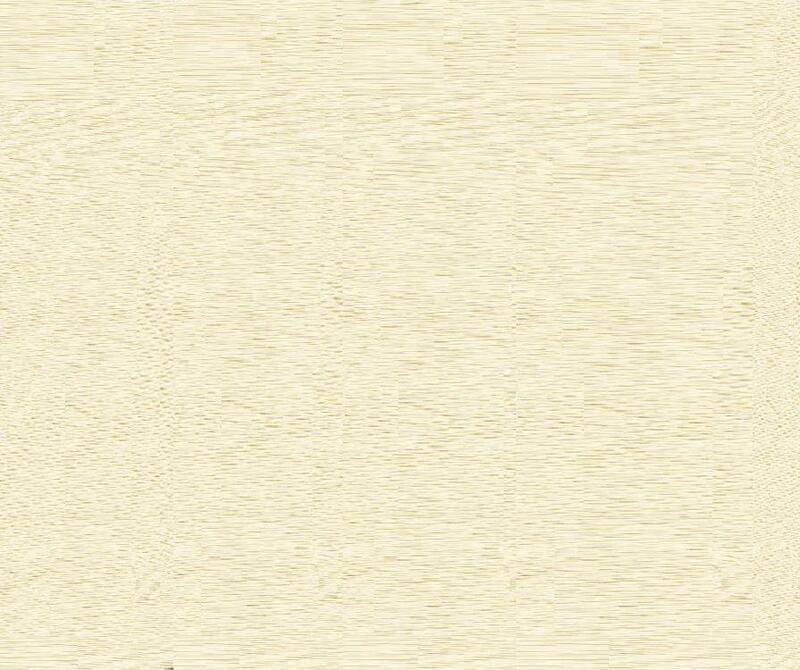 Again this one is simple to answer. 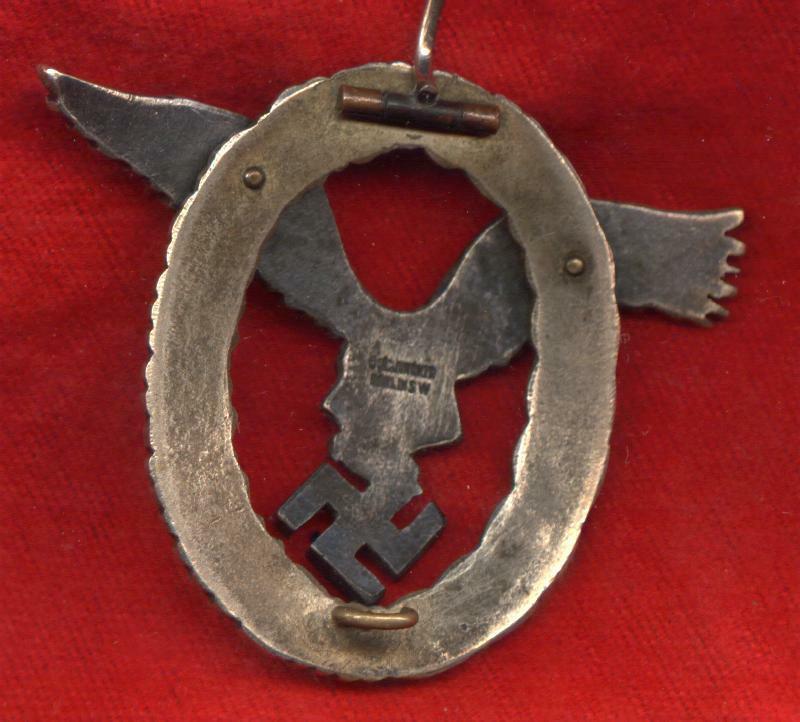 The person is only right in the fact that the component parts of the wreath and eagle should be identical. 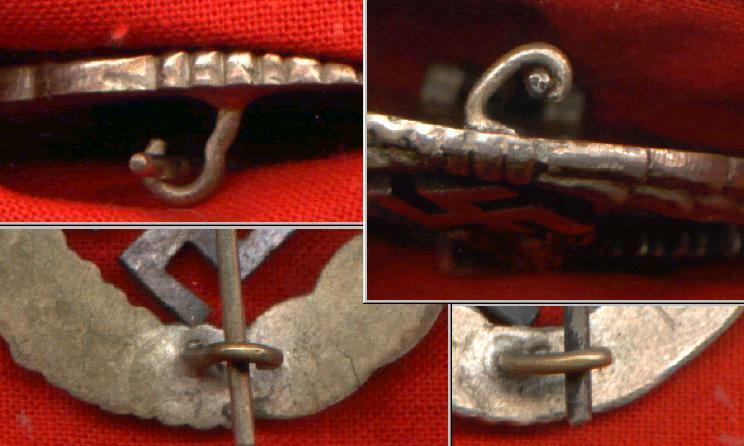 Unlike a machine made item, these components were fitted together by hand, drilled out by hand, the rivets attached to the back of each eagle by hand by solder, then the badge was assembled. 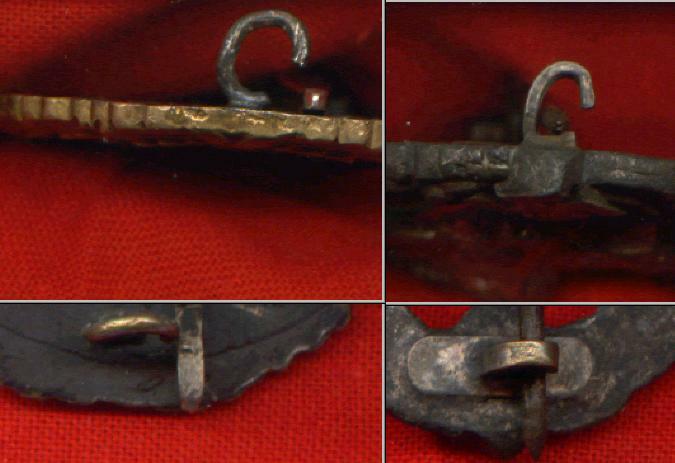 This is in fact a good example of how to tell a machine made reproduction as a computer will put each rivet into the same place, cut out the same hole and affix the badge in the same manner time after time after time. Whereas "Fritz" will missdrill one hole by a couple of mm, not get the same angle for each badge right and so although the die work is straight and true due to human inperfections minor differences should be noted. They may have been tutonic but not robotic.